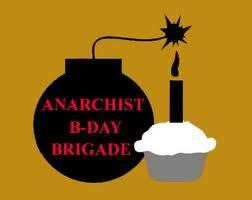 Join the Wingnut Anarchist Collective for a winter potluck and gift exchange. Everyone should bring a dish or non alcoholic beverahe to share, and 1 gift for the exchange. The gift can be new or used or ephemeral, like telling someone a story, playing them a song, or teaching them a skill. But please dont buy the gift new- regift or thrift or dumpster etc. Screw capitalism, lets not give those jerks anymore of our money for this event. We can share friendship and love without money honey. ” as to the trade day idea,here goes! All ages and sober event!!! Tuesday, August 7th is National Night Out. Barton Heights, and our newly re-forming neighborhood association will be celebrating in Yancey Street Park (At intersection of North Avenue and Poe Street). We will start at 6:30 and go til dark! There will be food to grill (vegan, vegetarian, halal options) and anyone who wants to can bring a dish to share! There will be local organizations tabling, entertainment in the form of a DJ and/or movie, a Know Your Rights training, and a Really Really Free Market (free clothes, books, cds, etc. anyone is welcome to bring items to give away). More details coming as we work them out. Please save the date and plan on attending! email wingnut_collective@yahoo.com if you have questions/concerns/want to help! And also- don’t forget that the next Barton Heights Neighborhood Association meeting will be on Tuesday, Sept. 11th at 6pm. Tell your neighbors, and let’s get the community out to talk about how to make Barton Heights a better place for us all! A Really Really Free Market (RRFM) is a community gathering where participants bring, and give away absolutely free, andy usuable items, skills, ideas, talents, friendship, excitement, discussion, games and many other things that we as a community can come together and share. A RRFM is a 100% free and non-commercial event, creating a gift economy as an alternative to the normal way of buying and selling. If this sounds like something you’d like to be involved with, we’d love to have your help. – If you have any ideas for things you’d like to see at the Really Really Free Market, get in touch with us. – Contribute something to the free market, spare stuff that you have around your house or work, some kind of entertainment, or a skill that you’d like to share with your community. -Tell your friends about this thing, the more people who show up the better it’s gonna be. We are the Wingnut Anarchist Collective, and we wanted to get in touch about a program we are hoping to bring to Southern Barton Heights starting this Spring. 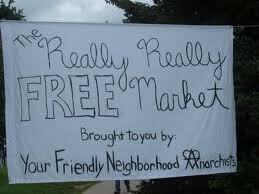 The event we want to organize is called a Really Really Free Market. 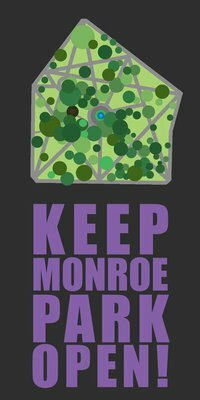 We have been involved in a Really Really Free Market that happens on a monthly basis in Monroe park for 3 years now. We have decided to focus more of our efforts on Southern Barton Heights, and want to try a Really Really Free Market here. Our plan is to have the first Southern Barton Heights Really Really Free Market on Saturday April 21st from 12 noon until 3pm in Yancey Street Park at the corner of Poe St. and North Ave. Earth Day is the following day, which makes it an extra approporiate day to encourage re-using and re-cycling of belongings instead of throwing away and buying new. The Richmond Anarchist Black Cross is calling for a meeting for people interested in organizing against the construction of a new Richmond City Jail. We are looking for allies! This meeting will be held during the Really Really Free Market at Main and Laurel in Monroe Park from 12-3pm. Stop on by to talk about this issue, pick up fliers for distribution, or to let us know what you want to do to stop this jail construction. This meeting is open to anyone interested in organizing against the jail, as we are interested in organizing around a variety of topics on this issue. Together we can fight better to stop the new jail construction. Since the August Really Really Free Market got rained out, you might have missed your opportunity to write the political prisoners who have birthdays in September. We also have print copies available at the Wingnut, if you wanted to come by Open Hours sometime this month to pick one up! Come on out to the September Really Really Free Market on the last Saturday of September from 12 to 3pm at the corner of Main and Laurel to join the Richmond Anarchist Black Cross in writing letters to Political Prisoners. Material and guidance provided!